In a large bowl combine both types of glutinous rice, add enough water to fully soak them and leave in a cool place for 24 hours. Fully drain your rice then place them in a food processor or a blender, pulse to have a grainy wet consistency and add a bit of water while grinding them. You need to achieve a gritty but fine consistency similar to a moist sand. Place the mixture in a lightly greased shallow tray, place in a steamer then steam for 20 minutes in really high heat or until cooked and tender. 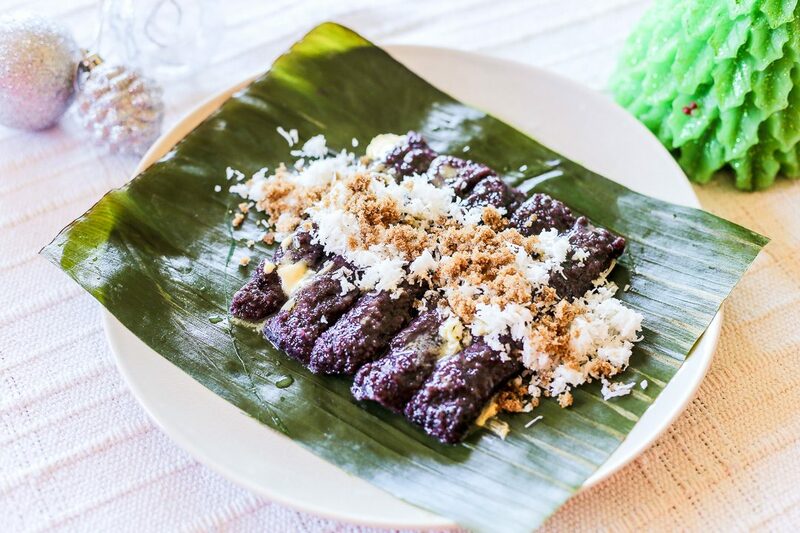 Remove the cooked puto bumbong from the tray, slice and shape into small cylinders, place on a banana leaf lined plate then spread some margarine on top, generously sprinkle it with freshly grated coconut and some palm sugar granules then serve.